French Prehistoric Sculpture: Description, Dating. Venus of Brassempouy (23,000 BCE). See also: Oldest Stone Age Art: Top 100 Works. A unique item of prehistoric art, the Venus of Brassempouy is a surviving fragment of an ivory carving (broken in antiquity) which was unearthed in 1892 at Brassempouy, in the department of Landes in southwest France in 1892. Dated to about 23,000 years BCE, this prehistoric sculpture is one of very few detailed representations of a human face, from the Stone Age era, and possibly the earliest known. It belongs to the European tradition of miniature "Venus Figurines" as exemplified by the German Venus of Hohle Fels (38,000-33,000 BCE), the two famous Austrian figures, the Venus of Willendorf (c.25,000 BCE) and the Venus of Galgenberg (also known as the Stratzing Figurine) (c.30,000 BCE), and the steatopygous Venus of Monpazier (c.25,000 BCE). To see how the Brassempouy carving fits into the development of ancient sculpture during the Upper Paleolithic tool cultures of the Stone Age, see: Prehistoric Art Timeline. The figurine was discovered during an archeological investigation of two local Brassempouy caves, known as the Galerie des Hyenes (Gallery of the Hyenas) and the Grotte du Pape (the Pope's Cave). The venus was recovered from the Grotte du Pape, along with several other human carvings, including - some time later - the "Lady with the Hood". See also Petroglyphs. However, there was no cave art found at the Grotte du Pape, only ivory carvings and tools. The Venus of Brassempouy - the surviving head and neck of the original figure - was sculpted from mammoth ivory. The carving is roughly 3.5 cm in height, 2.2 cm deep and 1.9 cm wide. Unlike the other venuses found at Brassempouy and elsewhere, this particular one contains clear facial features of forehead, brows, eyes, nose but no mouth. The top and sides are incised with a representation of braided hair or an Egyptian-style headdress. 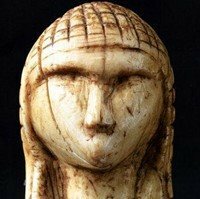 The realistic facial detail added by her ivory-carver makes her a unique specimen of mobiliary art, although we remain in the dark about the rest of her body, which was destroyed during Antiquity. The Venus of Brassempouy has been assigned to the era of Gravettian art (Upper Perigordian culture) of the Upper Paleolithic period - the last part of the Stone Age, and dated to approximately 23,000 BCE. The Venus of Brassempouy was created during the same period as several other similar statuettes, including the Venus of Dolni Vestonice (Czech Republic), Venus of Willendorf (Austria), Venus of Lespugue (France), the Venus of Savignano (Italy), the bas-relief Venus of Laussel (France), and the ivory carving known as the Venus of Kostenky (Voronezh). Other Russian venus figurines from the Gravettian era include: the Venus of Gagarino (Lipetsk) the Avdeevo Venuses (Kursk), and the Zaraysk Venuses (Moscow oblast), as well as the Venuses of Mal'ta, from near Lake Baikal in Siberia, the Magdalenian Venus of Eliseevichi (14,000 BCE), from Bryansk, the German Venus of Engen (13,000 BCE) - also known as the "Petersfels Venus" - and the Swiss Venus of Monruz-Neuchatel (c.10,000 BCE), the last of the famous Paleolithic female figurines. The Venus of Brassempouy is lodged at the Musee d'Archeologie Nationale near Paris, and is usually accessible to the public only during short temporary exhibitions of Stone Age art. A replica is on display in the Maison de la Dame at Brassempouy, along with replicas of the other figurines unearthed from the Grotte du Pape, as well as other famous works of Paleolithic art and culture, such as the Venuses of Willendorf, Lespugue, Mal'ta and Dolni Vestonice. Note: none of the Gravettian venuses are not connected with the Lower Paleolithic figurines known as the Venus of Berekhat Ram (discovered on the Golan Heights) and the Venus of Tan-Tan (discovered in Morocco).  For the earliest art of prehistory, see: Bhimbetka Petroglyphs.